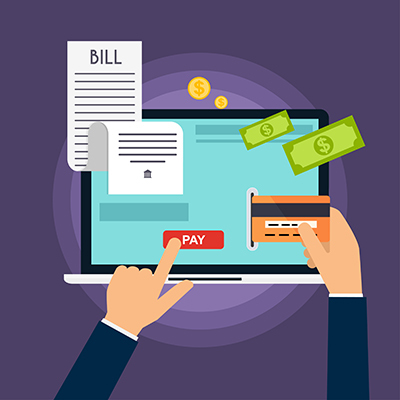 Online Bill Pay TM is simply a better way. Now it's easy to pay a friend, take care of a utility bill, and keep track of every payment. Schedule single or recurring payments in just a few steps, and you'll never worry about missing a bill or late fees. Save money on stamps and trips to the post office because payments are online. Save money on checks by submitting your payments electronically. Save time by setting up payees to organize the people and places you pay each month. Pay all your bills anywhere, anytime. Online bill pay delivers peace of mind to you. Protect against check fraud with electronic payments instead of unsecured mail. Guard against identity theft from lost or stolen checkbooks, bills and statements. Increase your privacy because only you can access your account information, account numbers and payment history. Maintain tighter control of your account from anywhere, at anytime. Put it all to work for you, by following 2 simple steps. During banking hours, you can contact one of our customer service representatives at 315-654-2115 (Cape Vincent) 315-649-2265 (Chaumont) or 315-658-2600 (La Fargeville).